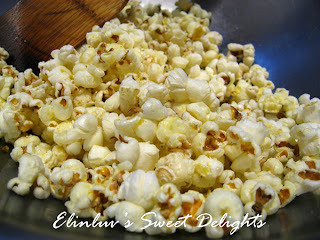 Elinluv's Sweet Delights: Homemade Popcorn - So Fun And Easy ! Homemade popcorn ! Plain ones are just as tasty as those with coated with caramel and cinnamon powder. 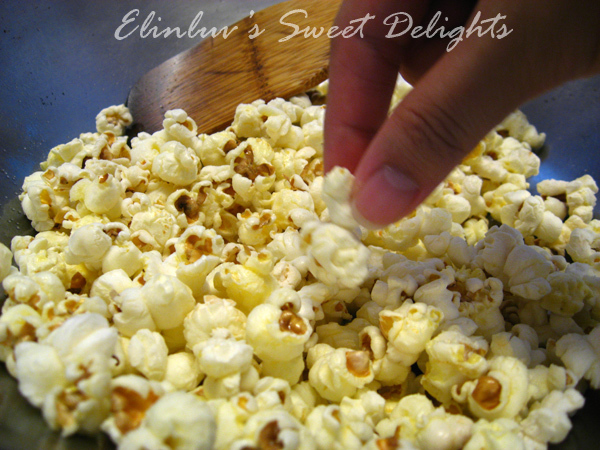 My Piggy Jo came back last month and taught me how to make my own tasty snack of popcorn that is fun and easy to make :) I have so much to learn from my daughter and it is pay back time for her :p For a healthy snack, I made them plain without any caramel or butter and it tasted good. I can't stop muching them as I watched the korean drama...this is what I would love to snack on without guilt... LOL! Turn your stove on high, and wait for it to heat up while you prepare the popcorn. Find a medium-sized stainless steel pot,cover the bottom, so that there is a layer of oil on the bottom- if you are cooking a half cup of popcorn kernels, 3-4 tablespoon of oil is recommended. Add the popcorn kernels, quickly put the pot top on and hold it down. Shake the covered pot back and forth so the kernels are coated with oil. Turn the stove down to between medium and high temperature. Do not rush the popping with high heat. Cooking popcorn over high heat makes the popcorn taste rubbery. High medium heat works best. Turning down too low the popcorn will not pop. When pot is 3/4 full, remove from heat and turn off the stove. Don't keep the popcorn over the heat too long as the popcorn will burn. Let the popping continue until the pot is full and has stopped popping and put the popcorn into a bowl. oh, that's easy! Must try it! YUM! I love homemade popcorn and i usually make a sweet version and pop them with sugar. :) I love this basic salty version too. Perfect for movie night at home.